Custom Printed Sports Bottles are one of the most versatile types of giveaways you can purchase. These sports bottles are inexpensive and fit most vehicles or exercise cup holders. Customized sports bottles are made of long lasting plastic which is BPA-free and comes with a retractable sipper spout or straw lid. According to Promotional Product Association International, drinkware, such as custom water bottles rank as one of the most popular types of items to be imprinted with a logo and used for promotional events. Custom printed water bottles can be given out at school field days or summer camps and can be used for walk-a-thons and marathons. With advertising water bottles you can add your company logo and give them out to employees as a way of replacing plastic water bottles that consistently enter landfills. Reusing water bottles does the earth a favor, so you'll be branding your logo and helping the planet. And because the logo water bottle is one of the most popular giveaways to date, they are available in a variety of colors, shapes, and sizes. So be sure to choose any of our custom water bottles for your next event. 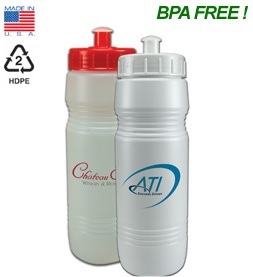 Custom plastic bottles will promote your logo and company name at ball games, at the gym and on the weekends. These are the bottles that people clamor for when a promoter is handing them out on the street or at the beach. Sports Bottles end up being used repeatedly by recipients because they are not too big, not too small. They're just right - for promoting your branding. Buy Promotional Items from Heritage Advertising - your online seller of Custom Water Bottles. Promote your product or create awareness using Custom Water Bottles with your logo imprinted on our products.